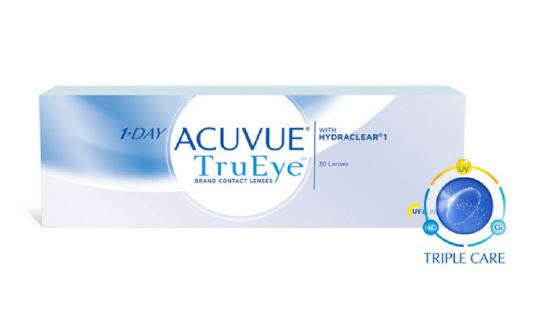 Johnson&Johnson 1-Day ACUVUE® TruEye® Contact Lenses (30 Pack) - A single use, daily disposable lens that offers the most oxygen permeability of any daily disposable lens. Great for people with a busy lifestyle, who want the best for their eyes. 1-Day Acuvue TruEye® contact lenses are an innovative contact lens designed to help maintain the natural state of the eye. It’s the first and only daily disposable contact lens made with a super-breathable silicone hydrogel material allowing almost 100% oxygen delivery to your eyes. And it includes HYDRACLEAR® 1 Technology, unique, wettable, ultra-smooth properties which support the protective tear film in the eyes keeping eyes moist and comfortable.